I got 6 blocks done this morning for the Bush Fire Quilts. I will get them in the mail this week and then if I get more done I can send them next month. The response to this project is quite amazing! 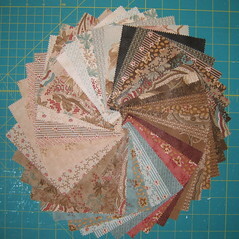 I also started getting projects ready to take to the quilt retreat. 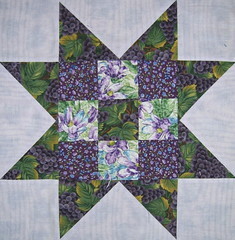 I have three small quilts to do the quilting and binding on, along with at least three other smaller quilt projects. I hope I have enough to work on - it seems like so little compared to what I usually bring. I am going to try to find a couple other small things I can bring because I would hate to run out of things to sew! This is one of the projects I will be bringing along. The other day I got this charm pack from my swap partner, Fanny, in the Mini Quilt In A Bag Swap 2 - Simply Charming. These are Howard Marcus Heritage from Moda. I have my plan and even got most of the cutting done. mini quilt in a bag part 2?? ohhh nooo ... i was hoping that there would be another, but i guess i missed the sign up. can't wait to see what you make with that beautiful charm pack!